Wendy, a six month old Bernese Mountain Dog, was presented after a long weekend with the babysitter. On Wendy’s first day back home with her family, she defecated two socks. Her owner’s were startled but she was still playful and happy. A few days later, though, she also vomited up two more socks (none of which matched the previously vomited socks) and started to have watery diarrhea. Wendy’s family realized that there is a possibility for more socks to be inside of her belly and brought her in to be checked out by a veterinarian. On physical examination, Wendy was tense and painful when her belly was palpated which was cause for concern. An x-ray of her abdomen revealed a fabric-like appearance in her duodenum and gas dilation of her small intestines… an appearance consistent with an obstruction! Wendy was taken to surgery for an abdominal explore to look for any more socks. It turned out that there was one remaining sock which was stuck at the junction between her stomach and small intestines. 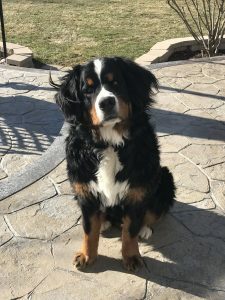 Due to its location, Wendy needed to have both a gastrotomy (surgical incision into her stomach) and an enterotomy (surgical incision into her instestine). The rest of her abdominal organs were healthy and there were no other foreign bodies within the gastrointestinal system. Wendy spent the night in hospital on IV fluids, antibiotics and pain medication to ensure she had the most comfortable recovery. She did very well overnight, was very happy to eat her breakfast, and went home with her family the next day. A few days later her energy levels came back and she started having normal stools again! Today, she is doing wonderful with no more instances of partaking a little too much in laundry day!